LA Times: Is Youth America Grand Prix worth the stress? Dancers: you betcha. The LA Times recently ran a fresh and revealing story about the Youth America Grand Prix competition in New York, the largest dance competition in the country. In addition to some background and interviews, the story features “First Position,” a film that chronicles much of YAGP, illustrating the ups, downs and inside-outs of fierce ballet competition. If you’d like to read more about the event or find out about the movie that documents it, check out the full article here. Professional dancers from Broadway and the Strip will be collaborating in a performance at the Stage dance studio in Henderson on Friday, April 27, at 5:30 p.m. If you’d like more information about the venue, the Facebook event is available here. Don’t let the lack of details make you dubious: shows at this venue tend to be a hotbed of cool new choreography and some nice experimentation. Tomorrow night’s show will also feature numbers from the students at The Stage. Be sure to get your ticket in advance, as the seating is limited and shows at The Stage tend to sell out quickly. Tickets are $20 for the first row, $15 for the second, and $10 for the first and floor seating. The Stage is located at 2510 Anthem Village Drive, Suite 150, in Henderson. More information about the studio is available here. The new, live version of the popular reality TV show “Dancing with the Stars” debuted at the Tropicana a few days ago. If you’re a fan of the show and attending a live taping of the original seems like a stretch, stop by the Tropicana any night but Tuesday for the next 12 weeks to catch the show. Click here for a video from News 13, and follow the link here to buy tickets. Antigravity yoga practitioners hang out (couldn't resist the pun) at Shine Alternative Fitness. Photo by Suwasit Ritthiphon. I’m going to ask you to think about two things. The first, a timeless feature in many a childhood, is a swing set. (If you’re like me, other memories reminiscent of fifth grade come to mind.) The second is a hammock–any kind you want, perhaps surrounded by shady trees or a nice water feature. Welcome to antigravity yoga with Kelly Millaudon at the new Shine Alternative Fitness, where working out is about more than ellipticals and swaying in hammocks is just the beginning. The practice centers on the hammock itself, which is made out of similar fabric as what you’d see aerialists climbing and twining around onstage in a Cirque du Soleil show. Each hammock is suspended from the ceiling a few feet off the ground; it will comfortable fold into the crease of your hips when you touch your toes if it’s adjusted properly. This height allows you to traction out your spine and limbs without compression, a feat purportedly not accomplished in traditional yoga techniques. You can sit on the fabric with it bunched up underneath you, like a swing, or you can lay out and have the material support you from top to toe — literally. You’ll have a single leg in the hammock to practice balance poses, or both legs in it with your hands on the ground to tone your arms and chest. A swinging, suspended savasana is the kiss-off at the end of the practice, a personal favorite of mine. Don’t let the serene swinging fool you, though. The meat of the practice is a strength and cardio workout that features an ab series, upper body exercises and stretches that hone flexibility and balance. You know that runner’s stretch that makes your thighs burn at the gym? Imagine doing that with your front leg supported at the knee by fabric, precariously — or so it feels — teetering on your back toes. 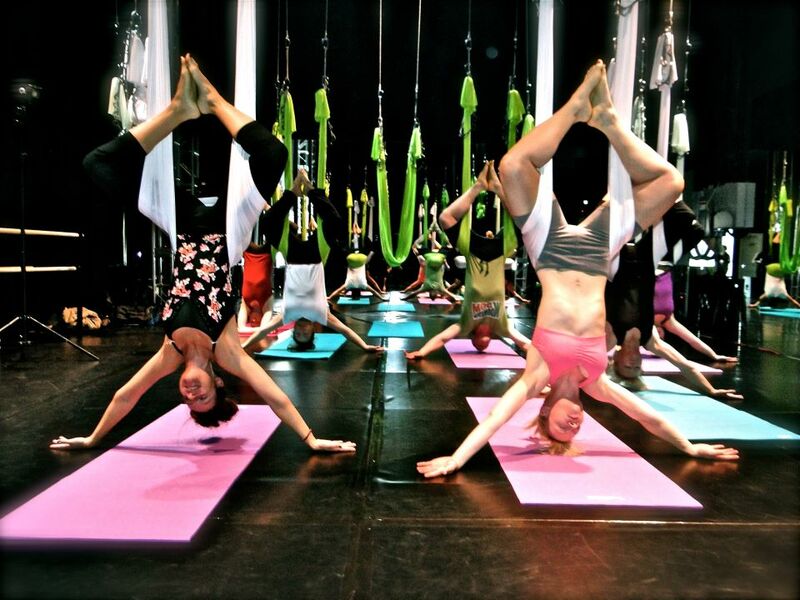 These challenges are what make antigravity yoga so enticing and addictive. And it’s fun! A big focus of the practice is having a childlike sense of exploration, which is a pretty natural response to dangling a few feet above the ground. If you’re a newbie to yoga or inversions, never fear. Kelly is a master of projecting an aura of calm enjoyment and Suwasit Ritthiphon, a Shine cohort who is being indoctrinated into antigravity yoga teaching, is often on hand to assist. If anything, give it a go at least once. I bet you’ll be coming back soon. Antigravity yoga classes are taught several days a week at Shine, located at 6415 S. Tenaya Way, Suite 100 (part of the Loftworks complex). For a full schedule, click here. A walk-in class is $25, with packages of 10 and 20 classes available at a slightly cheaper per-class rate. To learn more about antigravity yoga and its founder, Christopher Harrison, or to watch a quick video, check out the Antigravity Yoga homepage here. Happy hanging! “I was there” is the oft-quoted catchphrase of the Smith Center’s inaugural season, and it couldn’t be more appropriate than for Richard Velotta, a Las Vegas Sun writer and editor who saw Reynolds Hall from the best seat in the house: the stage. The Las Vegas Master Singers performed with the Las Vegas Philharmonic orchestra on March 24 in Gustav Mahler’s five-movement Symphony No. 2 in C Minor, “Resurrection.” Velotta, with enough choir experience himself to warrant a spot onstage, sang as part of a 240-voice chorus and wrote about the experience. The killer acoustics in Reynolds Hall cut both ways, as just as much sound is projected from the audience to the stage as vice versa. And applause, Velotta said, can be a kind, magical thing. For more about his experience, find the story here. The Review-Journal ran a review of the concert itself; find it here.